· Spinach Leaves are an excellent source of vitamin K, vitamin A, manganese, folate, magnesium, iron, copper, vitamin B2, vitamin B6, vitamin E, calcium, potassium, and vitamin C. They are a very good source of dietary fiber, phosphorus, vitamin B1, zinc, protein, and choline. · White Onion is antiseptic, anti-spasmodic and anti-biotic. It assists with asthma, detoxifying of metals and parasites, prevents cancer, protects brain, strengthens bones, aids digestion and purifies Blood. · Walnut assists with healthy blood formation, development and growth. It contains vitamin B complex and rich in vitamin E. It strengths kidneys and lungs, lubricates digestive system, balances good verses bad fats, improves brain health and metabolism, and fight free –radicals. 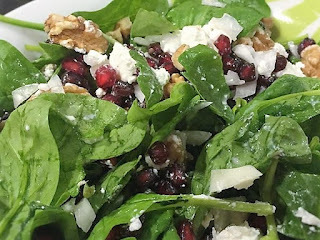 · Pomegranate provides relief from stomach disorders, protects against heart ailments, maintains blood sugar levels and blood pressure, and reduces risk of developing cancer. It also lowers dental plaque and helps reduce symptoms of anemia. In addition, it provides youthful and glowing skin and helps overcome depression. · Balsamic Vinegar is low in calorie which helps with weight loss. It lowers and stabilizes blood pressure levels. 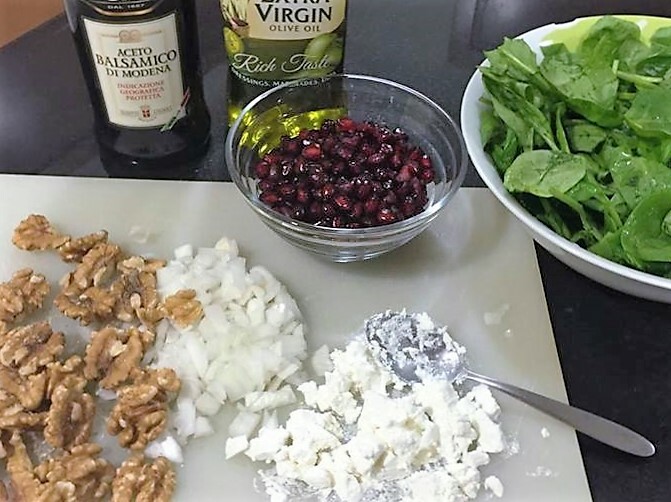 The polyphenols in balsamic vinegar limited the ability of LDL cholesterol to oxidize and this reduced the amount of damage done by LDL cholesterol on the body’s cells. · Olive Oil is rich in mono-saturated fats which helps protect against Type II diabetes. It helps with weight loss; maintain healthy heart, lower blood pressure, keeps healthy bones and healthy skin. In addition, it helps prevents colon and skin cancer. · Honey is anti-viral, anti-fungal and a powerful antioxidant. It helps ward off allergies, soothes sore throats and is a natural expectorant. It also stabilizes blood pressure and balances blood sugar levels, boosts immune function, promotes digestive health. 1- Place spinach in a salad bowl. Top with white onion, walnuts and feta. 3- Mix together the balsamic vinegar, the olive oil, the honey, the salt and pepper.